Merry Muscles baby jumper/exerciser is the BEST baby exerciser. 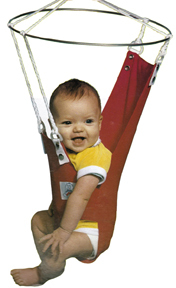 Scientifically designed by an occupational therapist to safely enhance your baby's muscular development, balance, and co-ordination---and for maximum FUN for your baby! For age 2 months and up. Get one for your baby today! We ship to most countries.